Support is welcome from foundations, institutions and individuals. Darwin Online is educational and non-profit. 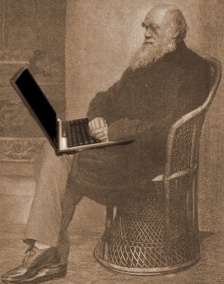 Help us keep Darwin's work online, for free, for everyone! • To assemble a complete collection of every edition and variation of Darwin's published works in English and translations in 30 languages in both electronic text and scanned image forms. • High-resolution colour scanning of Darwin's manuscripts. • Transcription of Darwin's heretofore untranscribed manuscripts- making the full extant corpus of Charles Darwin electronically searchable. • Editorial matter: more informative footnotes, introductions, interlinking, coding of the documents, translation of non-English passages. • Assemble and digitize all contemporary reviews of Darwin's works, in all languages. • Identify, assemble and provide online all of the works cited or referred to in Darwin's works. • You can also help by scanning or lending books or sending photocopies: See our list of works still needed. We welcome 19th century publications discussing Darwin and Darwinism - as well as secondary literature. To find out how you can help contact the Director, Dr John van Wyhe.